A new paper published by U-M researchers in pediatrics aims to destigmatize the Affordable Care Act, or ACA, by comparing it to a similar plan — one proposed by President Richard Nixon in the 1970s. Gary Freed, M.D., the Percy J. Murphy, M. D., and Marcy C. Murphy, R. N., Professor of Pediatrics for Child Health Delivery and professor of pediatrics and communicable diseases, and Anup Das, an M.D./Ph.D. candidate, examined the two plans in detail. Nixon’s plan, they found, outlined more liberal policies than the ACA and was criticized by the opposing party, a situation that mirrors the political climate today. Freed, also a professor of health policy at the School of Public Health, and Das hope that the paper will elucidate the facts of the Affordable Care Act, empowering Americans to make informed decisions unaffected by political rhetoric. [T]he aspects of the Affordable Care Act which were termed ‘radically liberal’ were actually more conservative than those proposed by Richard Nixon. Very few people in contemporary politics would accuse Richard Nixon of being a radical liberal. Could you explain why you and Das decided to investigate this topic? The Affordable Care Act has received a lot of attention over the last several years, and I was struck by the vitriol of the political debate. It seemed to me that the rhetoric was quite strong, and, in fact, stronger than likely was warranted with regard to the actual policy that was proposed. I [wondered] how much of the criticism of the policy was actually related to the components of the policy, as opposed to political posturing. It struck me that it might be worthwhile to look back at some of those previous policies to see how much they varied from the current policy — and to see what the political environment was at the time in which they were proposed. When the Affordable Care Act was proposed, I personally felt it was quite … modest, especially in a historical context. And as the rhetoric surrounding this became more extreme, it seemed to me a total disconnect with the actual provisions of the Affordable Care Act. Why did you choose the Nixon policy as a comparison for your study? I recalled … the Nixon proposal from the early 1970s. Nixon was the last Republican president to propose significant health reform. I remembered that many of the same components of the Affordable Care Act were actually contained within his proposal. When I went back and reviewed the Nixon plan, [I] was amused, actually, to find that the aspects of the Affordable Care Act which were termed “radically liberal” were actually more conservative than those proposed by Richard Nixon. Very few people in contemporary politics would accuse Richard Nixon of being a radical liberal, which made it even more surprising … It highlighted the juxtaposition and the irony of the current political debate. The rhetoric went on to include the idea that the Affordable Care Act was a “job-killing” proposal. I believe that very few people would have made those same comments, either today or in the 1970s, about the Richard Nixon plan. I believe that’s because most people don’t really have a sense of what’s contained in either plan and are reacting only in a political environment. It confirmed my supposition that … there not only were similarities between these plans, but also that … the Nixon plan was much more “liberal” than the Affordable Care Act. It struck me how much the political environment has changed, so that something … viewed as more conservative than Richard Nixon would be viewed by the same Republican party as radically liberal today. 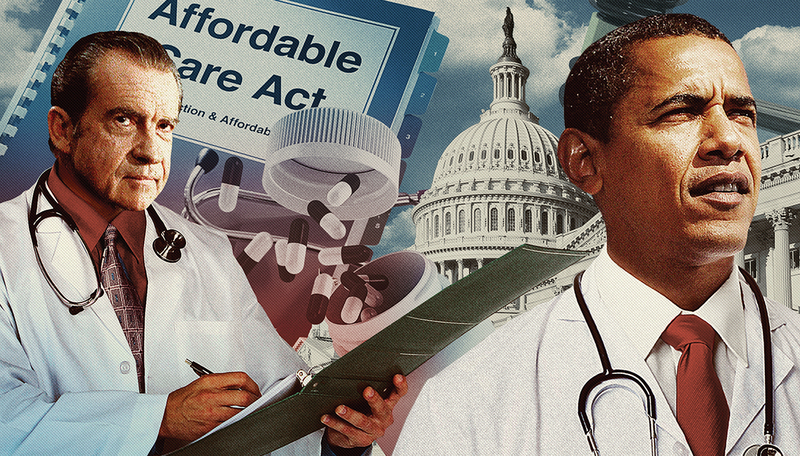 How do political biases affect the progress of health care policy or health care reform? I think what we’re witnessing is a rhetorical exercise in political grandstanding. The country is better served by actually having a debate on policy and implications in a realistic context as opposed to one that simply seeks to score political points.